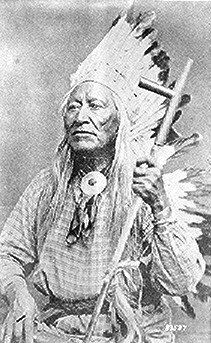 Chief Washakie, Shoots-the-Buffalo-Running, the Shoshoni chief for which Washakie County is named. Washakie County was formed in 1911 from Big Horn County. It was named Hanover County for 7 days before it was renamed Washakie County after the Shoshoni Indian, Chief Washakie. Washakie County is small in population with only one town, Ten Sleep, and one city, Worland. There are several census-designated areas. Worland is the county seat of Washakie County. Worland is named after Charles H. Worland who established a stage stop there in 1900. Ten Sleep was named because it was “ten sleeps” from the Great Sioux Camps near the Platte River and the northern camp near Bridger, Montana. New vital records and obituaries have been added from the 1908 Worland Grit newspaper.